6981 Aerial Intruder is a Blacktron Future Generation set from 1991. 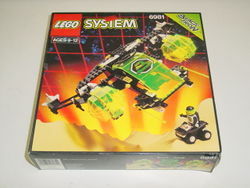 It contains a spaceship, a rover and two Blacktron Minifigures. The Aerial Intruder is the largest Blacktron Future Generation vehicle. It contains two smaller vehicles - a pair of rovers with control panels. Like all larger Blacktron Future Generation vehicles, it has a modular cockpit - however, unlike them, it has two. They have the standard completely enclosed cockpit design with a control stick inside. These ones also have a fin and a pair of wings with lasers on them. The main frame of the Aerial Intruder is built in a "T" shape. The front portion has a Transparent Neon Green windshield which covers the ramp from which the rovers are deployed. The windshield can be raised and the ramp can be lowered to deploy the craft. There is a pair of signal lights on the windshield. On either side of this section is a laser. The wings are behind this section, with a window in the back that allows entry in to the "hangar bay". There is space jetpack stored here. On either side of these wings, there is an extension on which is a rocket booster. The modular cockpits connect to the inside of the "T" shape. Below the vehicle there are six thrusters. This is one of two sets in which Part:2408p01 appears. Facts about "6981 Aerial Intruder"
This page was last edited on 29 April 2016, at 16:16.